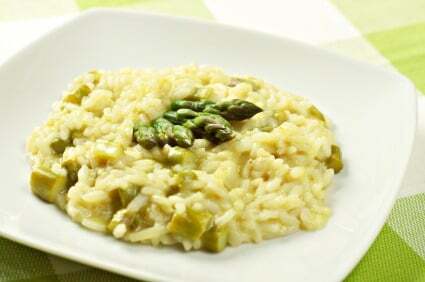 Try this new asparagus and prawn risotto recipe our Italian chefs have just created. Remove the head of the prawns and the black line of the intestine. Cut the back of the prawn and take the flesh out. Use the scraps of the prawns to make a stock: pour olive oil in a pot, place the heads of the prawns, the shells, the celery, the carrot and shallot. Then add water, seal the pot, and cook at low heat for 10 minutes. Finally pass it through a sieve and leave it to one side. In the meantime, prepare the asparagus: peel the asparagus, cut the lighter part. Chop thin slices of asparagus, and chop the raw prawns too. Leave to one side. For the risotto: pour the olive oil in a pan, chop thin slides of shallots and fry on a slow heat . Add a splash of water and mix with a wooden spoon gently. Melt the shallots and add the “Carnaroli” rice, toast the rice for some minutes, mix the rice with a wooden spoon. Simmer with white wine until reduced and add the strained prawn stock. Slowly add ladlefuls of the stock to the rice for 15-20 minutes, allowing the rice to absorb the stock before adding more. When the rice is ready and creamy, add the asparagus and mix for 19-20 minutes. Cook for 5 minutes more, add salt and pepper to taste. When the rice is almost cooked, add the prawns and mix. Turn off the heat, place the risotto in a platter, add the prawns with the head and the asparagus on the top.